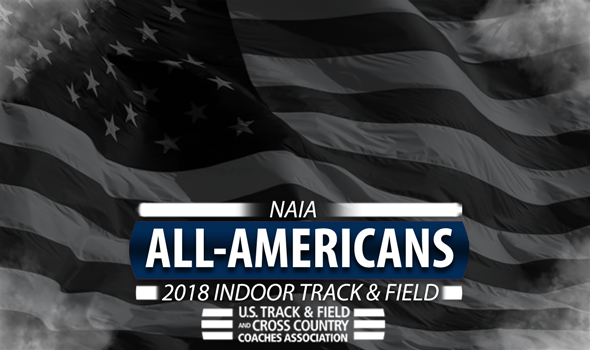 NEW ORLEANS – All-America honors for the 2018 NAIA Indoor Track & Field season were announced Monday by the U.S. Track & Field and Cross Country Coaches Association (USTFCCCA). Student-athletes earned All-America status by virtue of finishing among the top-8 in their events – including as a member of a relay – at this past weekend’s NAIA Indoor Track & Field Championships in Pittsburg, Kansas. Wayland Baptist (Texas) swept the proceedings inside the Robert W. Plaster Center as it won both team titles over Indiana Tech. The Pioneer men held off a spirited effort by Indiana Tech all weekend long. WBU might have had two fewer All-Americans than the Warriors (18 to 20), but it valued quality over quality. The Pioneers were led by Tre Hinds and Quintaveon Poole, who each had three All-American efforts. Cornerstone (Mich.) and Keiser (Fla.) both had double-digit men’s honorees as well. WBU’s women led their gender with 24 All-America nods. Twelve different women finished among the top-8 in their respective events as Ja’Ianna Williams led the way with four honors in the 600 meters, 4×400, 4×800 and distance medley relay. Indiana Tech had the second most All-Americans among women’s teams with 18. Aquinas (Mich.), Friends (Kan.) and Southern-New Orleans (La.) all had 10 or more women honored as well. See below for a full list of NAIA athletes who earned All-America status. Remember: Only USTFCCCA member programs are eligible for All-America honors.